if you are pursuing a one course in any stream than join side by side a short term or long term course in the same interelared field so that you can make yourself specailized in the interelated field & will become a successful /allrounder employee of the organization. 8. marketing & sales management. 9. export & import management. these courses are available in morning / afternoon / early morning & weekend batches. also iift has short term courses.degree courses in association with the eiilm university sikkim. degree courses in association with the global open university nagland. 4. 3yr degree course in apparel merchandising consultancy services provided by iiftthe institute provides consultancy services for its students as well as for other entrepreneurs to establish factory, an export house, boutique or a fashion-retailing unit in the following areas. the institute has a separate wing, which provides training and consultancy services to industry people on their specific problems. in-house industrial training is also provided. 2. fashion education - iift provides courses on above subjects as per detail above. 3. consultancy in garment trade- young entrepreneurs who are interested in setting up garment factory etc. are always helped by this wing of iift. 4. itfc services- iift is also associated with itfc, which generally help iift in organizing various seminars, exhibitions etc. throughout the year. iift also organizes seminars etc. for corporate bodies on their special requests. 5. video magazine on fashion - india’s first ever video magazine on fashion is released by iift’s associate concern “fashion vision” which provides awareness about latest and on going fashion trends in india as well as abroad. iift is also conducting cad courses with high-tech software lectra- the leading computer software available in industry worldwide. computer aided designing training facilities are also available for two-year course students and for corporate bodies as well. 7. placement cell– over 500 export houses, buying houses, manufactures & retailers iift is due to tireless work of placement cell we can find iift students in various prestigious export houses and buying houses. for dramatic & exports market iift do provide consultancy in fabric trends, fashion trends and forecasting. this wing develops forecasting for coming season styles and trends well in advance for exporters and for domestic market. special market attention is also paid while doing the forecasting etc. on specific special request iift handles the projects where in it deals in sample / range making on the basis of its production / forecasting for seasons specified by the buyers / exporters. each year iift makes its own designers’ catalogue as well which is generally provided to all exporters and buyers etc. special in company training programs are organized for exporters etc. many seminars for exporters, designers, artists etc. are organized from time to time by iift. international conferences participation and presentation of papers are also done. iift also promote its designers through various fashion shows. iift has organized more than 300 fashion shows during the last 19th years. career exhibitions, designers exhibitions are also organized for schools / colleges throughout india on request. this division of iift is totally dedicated for research and development in the field of fashion, commercial art and interiors. various business tie-ups with its sister concerns like fashion vision, itfc etc. 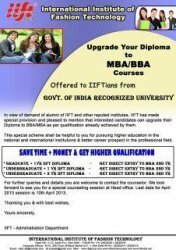 are undertaken by iift. “delhi college of fashion” - a training centre for international fashion and garment studies was established in luck now & delhi in 1996.
the main activities undertaken by design & resource division are fashion forecasting, fabric research, designs creation, market identification, quality control, domestic market research, international market research, manufacturing facility guidance, designing the ranges for domestic and export market, trade fairs and design presentation etc. a boutique of iift is established in new delhi. it has high fashion garments of traditional & western wear designed by the r&d department of iift & upcoming designers. this boutique has outlets in middle east, uk, france & in mauritius. the collections of students are also displayed in collection. iift is having its over then 65 franchise centres in india & abroad. iift has its own website i.e., www.iiftgroup.com, www.iiftindia.net has all the information about our latest developments and achievements. further information can be had from the site. iift corporate centre is established at m-15 g.k. – i, m-block market where in all corporate level decisions are taken accordingly. iift has its own website i.e., www.iiftgroup.com, www.iiftindia.net has all the information about our latest developments and achievements. further information can be had from the site. iift is also iso 9001:2008 certified fashion institute. 21. iift has organized international fashion show on 8th october 2010 along with bradford college u.k. during commonwealthgames 2010 in new delhi. 22. iift has participated in animation festival organized by bradford college u.k. in national media museum between 8th november 2010 – 13th november 2010. 23. iift has organized “ international fashion extravaganza’2011 in mauritius feb 2011 where in 22 designers from over 6 countries participated including famous bollywood designer manish malhotra. 24. invited by mrs. india worldwide to judge the contestants.